There comes a time in a homeowner’s life when they debate whether or not they should do renovations on their house. Many people opt out of remodelling because they’re unsure of which projects they can do themselves and which ones they need a professional to do. They believe that contractors would be much more expensive than doing it themselves, so they just do nothing or try it themselves. DIY remodelling is taking hold of not only the internet but the renovation world as well. With so much information out there telling you to do things on your own, you may be tempted to take on more than you’re qualified to handle. If you’re working with anything electrical you should get a professional and not do your electrical work yourself. You should never try to fix your house’s wiring by yourself. It can be so easy for you to make a dangerous mistake. An electrician, on the other hand, can quickly fix the wiring to your new light switch without harming anyone. You should just bite the bullet and protect your home by hiring a contractor who works with electrical wiring. Electricians are also up-to-date on local Perth codes so that your wiring is safe. Whenever you want to install a major appliance, you want to upgrade your electrical panel. Your home’s electrical panel is responsible for powering your circuit breaker, so anytime you do install a new appliance or build an addition, you want to ensure that your house can handle all the extra electricity surging through your home. When you’re upgrading a room in your house, you have to take lighting into consideration for the new design. Changing up your light fixtures can transform the feeling of the entire space. While choosing the right light fixture can be done on your own, installing it should be left to the experts. An experienced electrician can easily deal with the wiring that hooks up to the light fixture and not make a costly mistake like you could. Much like light fixtures, the wiring behind ceiling fans is complicated. The way it’s wired is probably different than other houses since wiring standards are always changing. Electricians are educated in how houses were and are wired. They know what each wire does, which is why you should call them if you’re planning on installing a new ceiling fan. While going the DIY route can save you a few dollars, there are a few drawbacks. The first is if you mess it up, it’s not going to save you any money because you’ll have to hire a professional to fix it. It also costs you time. If you’re looking to start a DIY project, you have to have a lot of time on your hands. For example, if you’re upgrading your flooring and you only have weekends off, then it’s going to take a very long time to get done. While it will be fun at first, you are sure to get tired of it in the long run. You should do DIY projects if you know they’ll be quick and you’re absolutely sure you know what you’re doing. You can rule out any projects that require licensing, gas or electricity, and anything that even has the potential to damage your home or you. Electricians know what they’re doing. They’re knowledgeable on what local codes are, how wiring has changed over the years, and what wires do what. They are qualified to help you complete any home project that you have in mind and can get it done quickly. They are equipped to make any modification or repairs you need. Don’t put your home or self at risk, call an electrician. If you are looking for an expert electrician in Perth, then look no further. 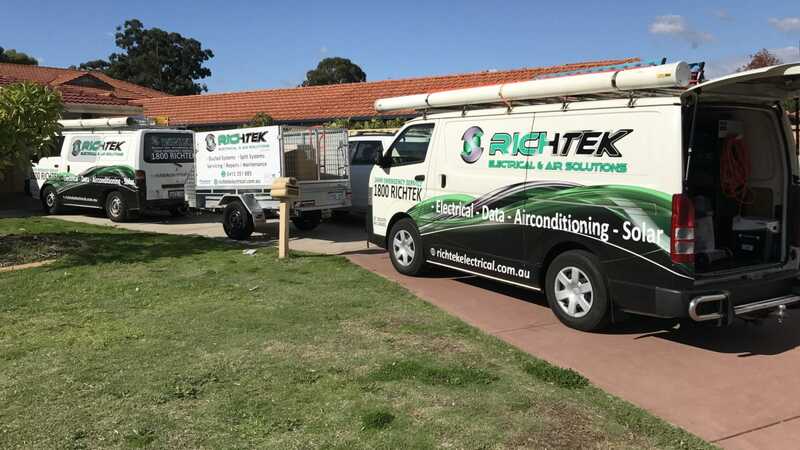 Ricktek Electrical & Air Solutions is the solution to all your electrical remodelling problems with experience in residential electrician services. Feel free to contact us for any inquiries. You can rest easy knowing that your house will be in great hands when you choose our dedicated team.